computer sms Mighty Text SMS sms from pc texting Sending SMS from your phone but on the PC? Sending SMS from your phone but on the PC? Some people have been seeing that EvolveSMS and Pushbullet will have an integration for sending SMS from your computer. Whether this be at home, at the office or anywhere else. Some may fail to notice that this has already been accomplished and not application specific and it will work with whatever SMS app you have on your smartphone. It's called MightyText. The principle behind mightytext is to sit there and look pretty. The application is only there to listen for when your going to be sending it information through various means such as the MightyText portal or the Chrome Extension. This isn't limited just to the web! 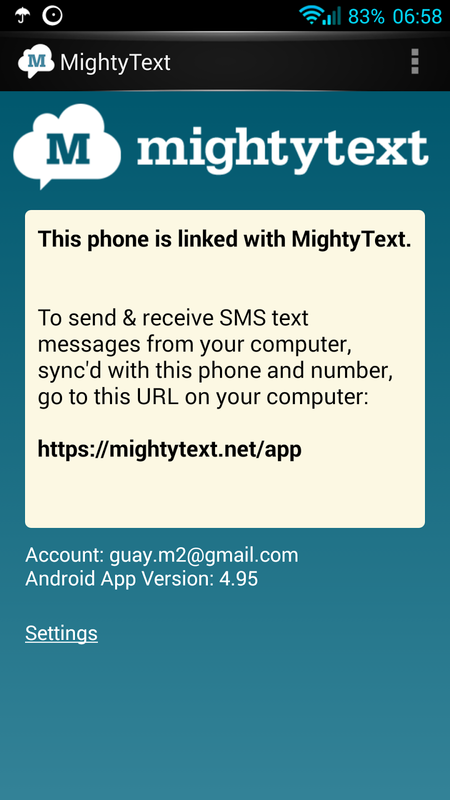 You can use the MightyText tablet app that will interface with the app on your phone so that you can send and receive SMS on any of your devices. You can get the app from the Google Play store (remember it's only a relay) once you've installed it and signed in the rest will be done from you PC and you won't need to interact with the app on your phone anymore.